This was a serendipitous find at the library. It’s a thought-provoking book masquerading as entertaining light reading. It was a Hindu Prize nominee in 2011. Each year the storyteller Hassan gathers listeners to the city square to share their recollections of a young couple who mysteriously disappeared some time ago. As various witnesses describe their encounters with the couple – their tales overlapping and contradicting each other – Hassan hopes to light upon what happened to them, and clear his own brother of any involvement in their disappearance. As testimonies circle an elusive truth, the couple take on an air as enigmatic as their fate. But is this annual storytelling ritual a genuine attempt to discover the truth, or is it intended instead to weave an ambiguous mythology around a crime? Watching her gyrate, it struck me how little these foreigners respect our culture. They import their mores and flaunt them before us, they exoticise us, to them we are the great unknown, a blank slate on which to impose their fantasies. And we encourage them, to our lasting shame. When a woman thinks she can behave like that, what happens? Men’s minds thicken. They begin to think primitive thoughts. They forget the words of the music and feel only the throbbing beats. Then even that turns into something else: a dull, burning pain. Their hearts sting, their faces turn black with heat and range. This much admired and respected father regrets her betrayal, not her murder. And Hassan’s casual acceptance that his father has possibly been involved in a so-called honour killing made me think: I hope these attitudes are the characters’, not the author’s. There are many philosophical questions to ponder. Hassan’s brother Mustafa challenges the storyteller’s view of the world. From his prison cell, Mustafa says that the Maghreb is so small that it makes him laugh. He admires what he has seen of Westerners for their impeccable behaviour and air of refinement and he rejects Hassan’s plea that he should have more respect for his own heritage. Mustafa yearns for more: he feels oppressed by the same faces, the same dull and provincial countenances. He doesn’t agree with Hassan that the Jemaa was a crucible of people and ideas and a microcosm of the world and encapsulated all that was best in it. Mustafa thinks this is an illusion. Although I’ve never been to the Jemaa or Morocco, I think I agree with Mustafa that seeing the world in an open-minded way is an antidote to insularity. But I also agree with Hassan that Mustafa has seen only tokens of another culture and has let himself be swayed by a casual [and offensive] assumption of superiority. (BTW The author was born in India and was educated in politics and philosophy in Calcutta, and at the University of Pennsylvania. He’s not Moroccan). And then there’s the spiritual issues. Hassan and his friend Nabil discuss the motives of the Westerners in coming to the Jemaa. Were they seeking oblivion? There was certainly that element to them of wanting to forget. But to forget what exactly? Perhaps the world they came from? I speculated. Modernity? The West? These are things we will never know, I suppose, things to which there are no clear answers. 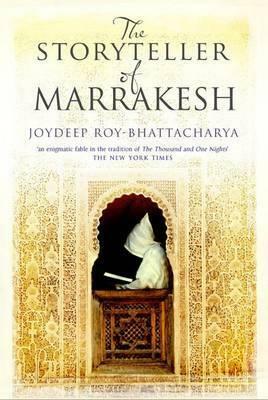 The Storyteller of Marrakesh is a very clever piece of meta-fiction which is not only a beguiling mystery but also an opportunity to explore all sorts of ideas. Buy it from Fishpond: The Storyteller of Marrakesh or any good bookshop. Sounds fascinating, Lisa. And it would make a great companion read to Season of Migration to the North, which also explores notions of storytelling and the West’s so-called corruption of Arabic-Africa.